Even in the depths of winter’s erratic weather, there are three things you can count on —snow in Buffalo, wind in Chicago and the reliable warmth and soft-shell weather protection of Patagonia's Jackson Glacier Parka. This warm, sophisticated parka provides windproof, weather-resistant protection to smooth out winter’s highs and lows. 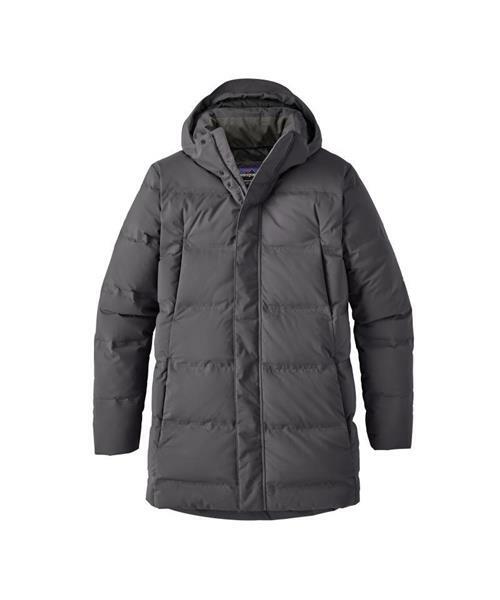 Insulated with 600-fill-power Recycled Down (reclaimed from duck and goose down products), it feels like you’re wrapped in a soft comforter when you head out the door. The 2-layer soft shell, made from a 50-denier 100% polyester fabric, has a buoyant, supple hand along with a DWR (durable water repellent) finish to shed moisture and increase durability. A 100% recycled polyester ripstop lining wicks moisture and glides smoothly over layers. For additional weather protection there’s a removable, insulated hood and a 2-way waterproof center-front zipper with a zipper garage at the chin to protect exposed skin. Handwarmer pockets with waterproof zippers are lined with brushed jersey fabric and there’s an internal security pocket (with headphone compatibility) that closes with a zipper. With a streamlined silhouette and a length that reaches the thigh.